Photo of Renata Morales– (top) and Sam Purdy– (bottom) designed shoes by Danijela Pruginic courtesy of Worn Fashion Journal. FASHION: What is probably the most exciting exhibit to hit the Bata Shoe Museum in quite some time is opening today: Worn Fashion Journal’s Art & Sole exhibition. The mag invited twenty-four creatives—from fashion designers to art collectives—to re-interpret that hipster staple, the Ked. 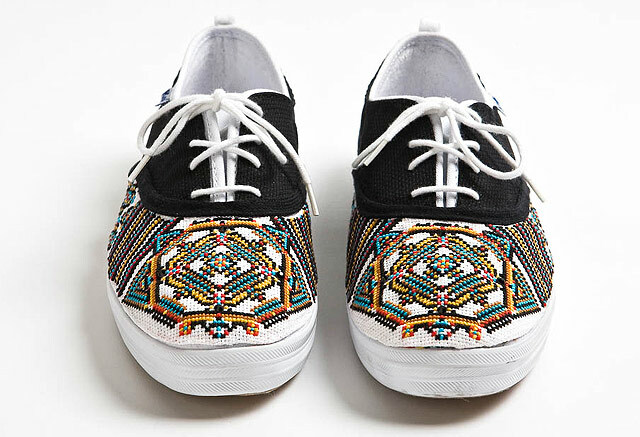 Shoes range from the quirky (like the Mexican-born, Montreal-based fashion designer Renata Morales‘s) to the cute (check out the pair by Sam Purdy, who is one-half of the craft team Pin Pals). Don’t miss the closing gala on June 6—more details about that to come! Bata Shoe Museum (327 Bloor Street West), $12. ART: Local artists Steven Kado and Brian Joseph Davis join forces in a performance art piece at the Mercer Union tonight. Riffing on composer Alvin Lucier’s experimental-music installation of a vibrating piano wire, the duo are modifying the piece by playing metal band Neurosis over top of this sound for six hours, six minutes, and six seconds. The show goes down at 6 p.m., lasting until six minutes and six seconds past midnight. Mercer Union (1286 Bloor Street West) 6 p.m., FREE. COMMUNITY: Remember that whole hullabaloo over whether that east-end neighbourhood is called “The Beach” or “The Beaches”? Well, it appears to be settled now that the new street signs have arrived. To celebrate The Beach’s new, or at least codified, name, the community is throwing a party at the corner of Lee Avenue and Queen Street East. (Queen Street East and Lee Avenue), 9:30 a.m., FREE. MUSIC: Check out the melancholic rock band The National tonight if you can: tickets are scarce for the popular Brooklyn five-piece. Kool Haus (132 Queens Quay East) 8 p.m., $24.50. CRAFT: As part of an ongoing series of trading parties, Magic Pony is hosting a monster-themed market tonight at the Queen West shop. Blind-box collectors can swap toys like Labbits and Dunnys and, with a little luck, complete their mini-figure set. Beyond mini monsters, there will be snacks, special promotions, and a chance to meet fellow collectors. Magic Pony (694 Queen Street West) 6–8 p.m., FREE.